Every children’s book leaves children with a lesson to learn, and Charles Dickens’ classic “A Christmas Carol” is no exception. It tells a story about how one miserly individual learns to become generous at a time when the spirit of giving is all around. This makes A Christmas Carol personalized book a great children’s gift for the holidays. This is especially true if you want to impart valuable lessons to your children, nieces, nephews and other youngsters. What exactly will children learn from one of the best loved classic books? Ebenezer Scrooge, the “squeezing, wrenching, grasping, scraping, clutching, covetous, old sinner”, as described by Dickens, was oblivious to the plight of the poor, showing more love for his money than his neighbours. But as the story unfolds, the old miser was made to realize what can happen to the family of his loyal employee Bob Cratchit and to him if he wouldn’t stop being greedy and start caring. The ghosts that visited Scrooge during Christmas showed him that by helping others, he can improve his life for the better. The Ghost of Christmas Present showed Scrooge that Bob’s family,though poor, and his son, Tiny Tim, stricken with a terminal illness, are celebrating a joyous Christmas. They are fully content of their small dinner because they are together. The family is complete during the holidays and it is more important than any amount of money or material things in the world. Scrooge, on the other hand, has lost the possibility of love and friendship because of his negative ways. Who knew the old miser can change his ways? Thanks to the Ghost of Christmas Past, the Ghost of Christmas Present and the Ghost of Christmas Yet to Come, Ebenezer Scrooge became a renewed person before Christmas ended. By getting a glimpse of what can happen if he doesn’t change his ways, he woke up on Christmas Day with a decision to help Bob’s family and to spread happiness in the city of London. His kindness, compassion and generosity continued long after the holidays were over. This goes to show that even the worst kind of individual has the chance to change their ways and be someone different and better. What exactly is the meaning of Christmas? What most children don’t know is that it is more than just a season to enjoy great food and receive gifts. It is also a time to give, especially to the less-privileged ones. It is also a time to redeem oneself, as what had happened to Scrooge. Most importantly, it is the season to spend time with the family, celebrate with love and happiness even in the absence of gifts or plenty of food. As what Bob’s family showed in the story, the simplest of dinner is enough, as long as he is together with Tiny Tim and the rest of his family. 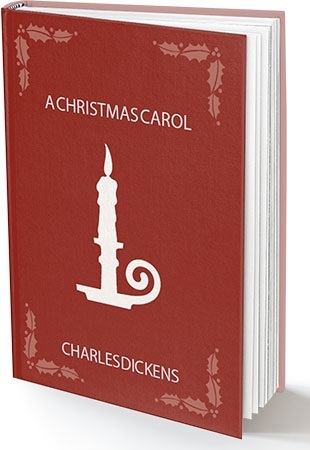 Because of these lessons, A Christmas Carol is the perfect holiday gift for kids. Opt for personalized gifts for kids to make it even more special.